Note: You have to click OK?in this dialog or use the Enter key. This feature will find, highlight and center in the window, parts by their Prefix (or reference designator). ?However, it cannot be used to find net names or other text in a schematic. This is where the Design Manager?comes in. Left Navigation Panel > Design Manager, or use hotkey ctrl+D. 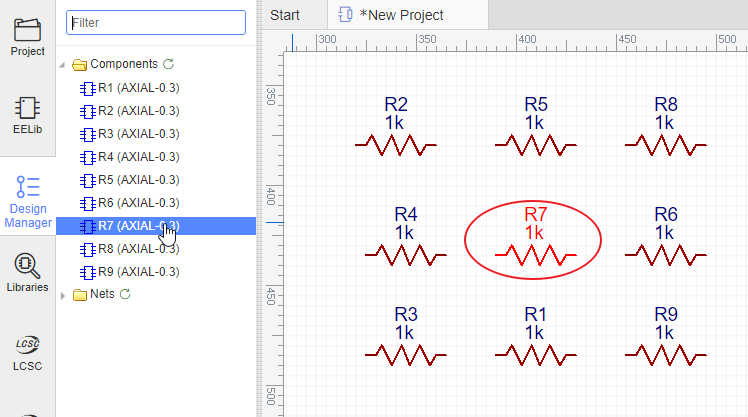 The Schematic Design Manager?is a very powerful tool for finding components, nets and pins. Clicking on a Component item highlights the component and pans it to the center of the window. EasyEDA provide a powerful find similar tool, you can find what you want very easily. Kind: Select the object what you want to find. 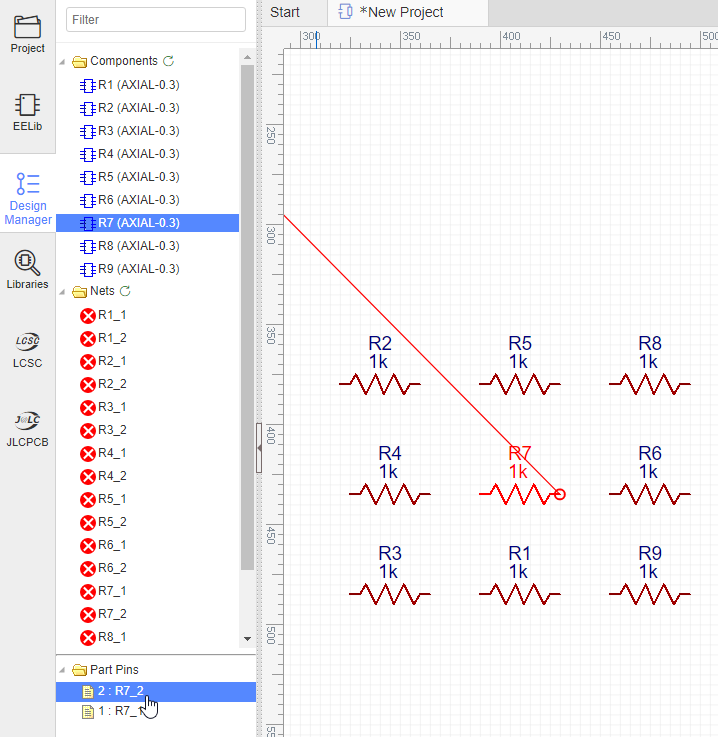 Range: This option only for the schematic, you can find the object for current sheet or all sheets. Find Parameters: Any: Find any objects; Same: Only find the object which attribute same as this attribute. Different: Find the object which attribute is different than this attribute. 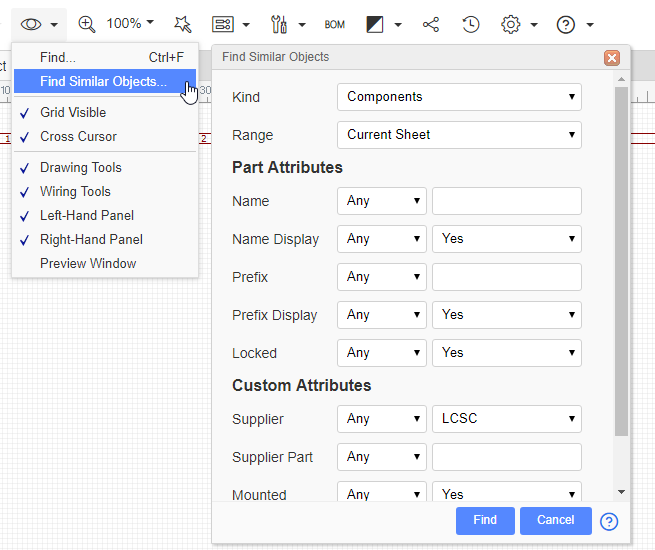 After click the “Find” button, all the siutable objects will be seleted, and the right-hand panel will show all the attributes, the different attributes will show as the <...>, you can change the attributes directly, and they will apply to all selected objects. 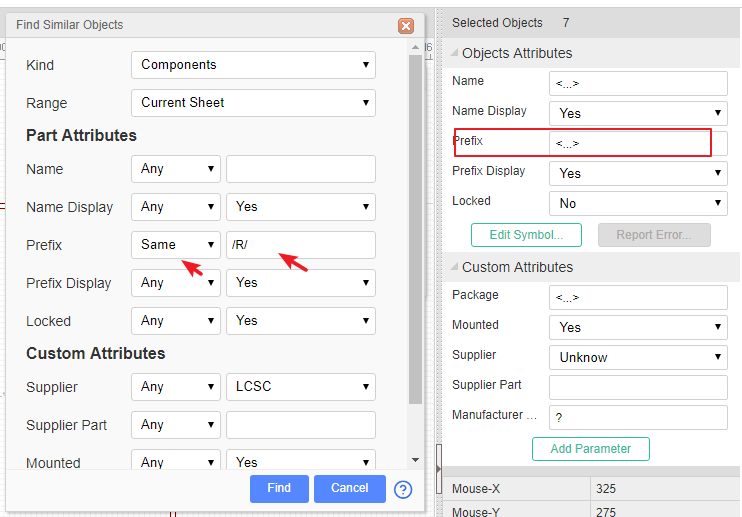 The find similar objects only support to find a part of custom attributes. Such as package, suppiler etc.